Toshiba's Portégé laptops are built for the business user, and the R600-13Z is a fantastic laptop which cements the Holy Trinity of portability, performance and usability under one roof, with very few concessions made - despite its small and very light form factor. The laptop boasts the inclusion of a dual-core Intel processor and 3072MB of memory. Running word processors, internet browsers and email clients simultaneously won't prove an issue for this laptop, making it more suited to intensive work than the Sony VAIO VPC X11Z1E/X. As with the competition, an integrated graphics card is employed and means very little multimedia work is possible. This machine also provides the least amount of storage space, with only 128GB of space in place via a Solid State Drive – similar to the one used in the Sony. Unlike a standard mechanical hard drive, the SSD is less susceptible to damage and therefore minimises the chances of data loss if dropped. If you want to know more about SSDs, check out our all you need to know feature. Toshiba has also done well to fit an optical drive into the very small chassis. Not only can you listen to music CDs and watch DVDs but you can also back up your work to recordable or rewritable CD or DVD. The 12.1-inch screen features a 1280x800 pixel resolution and provides a sharp and crisp picture. It uses transflective LED technology which absorbs and then bounces light back out, providing decent colour reproduction and excellent contrast, even when outdoors. The laptop is intelligently built and, while some have complained about the excessively flexible screen lid, Toshiba has in fact designed the laptop this way to reduce the risk of cracking under pressure. Although the chassis feels weak because of its low weight, it is in fact highly durable. The keyboard boasts a well-spread design with tapered keys that are very comfortable to type on. There is a little sponginess, but the board is water-resistant and we've witnessed it be flooded with liquid while the rest of the laptop continued to run fine. Portability is good, with an impressive weight of only 1kg and an excellent 385-minute battery life. While not as long as the Asus' here, this provides you with pretty much all day usability. A raft of extra features have also been crammed in, including a 3G module, fingerprint reader for added security and even an eSATA interface. 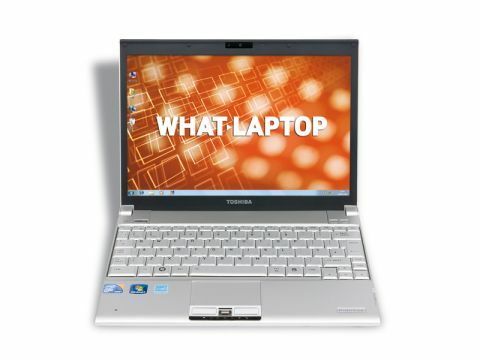 The Toshiba Portégé R600-13Z impressed us almost across the board. It is expensive but, unlike the Sony, this is because it's packed with cutting-edge technology that provides great performance and usability.